∼ 2011 ∼ February ∼ 02 ∼ Palmers Cocoa Butter For Stretch Marks! 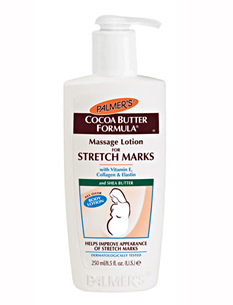 Palmers Cocoa Butter For Stretch Marks! lotion. Now, I have read and been told of stretch marks that, “If you’re gonna get ‘em, you’re gonna get ‘em!”, and that lubing up before, during and after pregnancy doesn’t do much for your skins elasticity. But… I have been rubbing this soothing salve on my tummy for months and so far so good! It has kept my growing belly soft and itch free during this special time. I alternate a little with coconut oil as well as olive oil, but, the Palmers Cocoa Butter has been, by far, the best balm I have tried. So, if you are planning a pregnancy, expecting or dealing with post baby marks (it’s not too late!) pick up some Palmers Cocoa Butter For Stretch Marks! OMG OBSESSED! *Also great for keeping skin soft during cold, dry winter months!